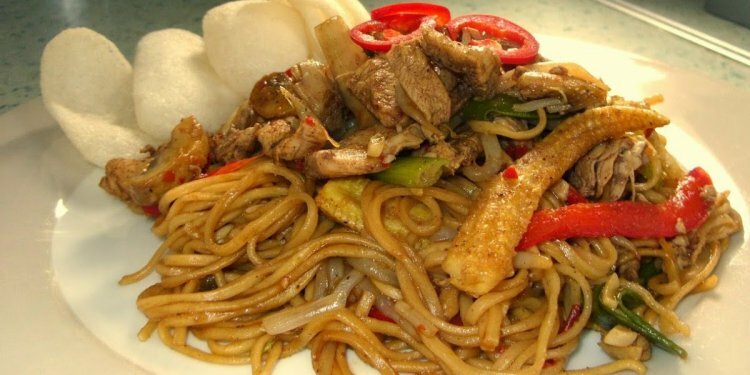 Cantonese style chow mein dishes are very popular in Chinese restaurants. I love the crispy noodles topped with saucy meat/seafood and vegetables. Beef and Chinese broccoli (“gai lan” or “kai lan”) chow mein is just one of many delicious variations. Use whatever ingredients you have on hand. This dish is very simple to make, although it is slightly labour intensive. A healthier and less labour intensive option is to mix the noodles in with the toppings instead of pan frying the noodles separately. Photo on the left: You can see the crispy noodles along the edges of this dish. That’s the best part of this meal and it’s Very easy to do it just like the restaurants. Marinate the beef with the garlic, soy sauce and 1/2 tbsp corn starch for at least 1 hour. Meanwhile, in a small bowl, mix together the broth, oyster sauce, rice wine, sesame oil, white pepper, and cornstarch. Set aside. Bring a large pot of water to boil over high heat. Meanwhile, lightly grease a pie dish (or a glass round baking dish) with vegetable oil and set aside. When the water comes to a rolling boil, add the noodles. Cover the pot with a lid until the water reaches a rolling boil again. Then loosen the noodles with long chop sticks and cook the noodles as per the directions on the package (45 seconds to 1 minute for pre-steamed packaged noodles). Drain very well. Then press the noodles into the prepared pie dish with a weighted plate. Set aside. Note: This step shapes and compacts the noodles which will make them crispier and easier to flip and plate. Heat a wok over high heat. When the wok is very hot, add 2 tbsp vegetable oil and swirl to coat the bottom half of the wok with oil. Add the ginger and Chinese broccoli. Stir constantly until the vegetables are tender but still crisp, about 2 to 3 minutes (the cook time will vary depending on the size of your Chinese broccoli). During that time, you can add water to the wok to prevent burning. This will help cook the vegetables faster (by steam) and maintain moisture. Add 1/8 cup of cold water at a time, adding more only once the wok completely dries up. Just a warning that this will create some smoke. When the vegetables are done, dish out and set aside. Wipe clean the wok and return it to high heat. When the wok is very hot, add 3/4 cup vegetable oil. When the oil is very hot, carefully add the noodles while trying to maintain their shape. Leave the noodles undisturbed until the bottom side is crispy, about 2 minutes. Then turn the noodles over and fry the other side until crispy, about 2 minutes. Plate and set aside. Alternatively, you could pan fry the noodles in a large skillet. Clean the wok, wipe it dry, and return it to high heat. When the wok is very hot, add 2 tbsp vegetable oil and swirl to coat the bottom half of the wok with oil. Add the onions and stir constantly until they are translucent but still crispy, about 1 minute. Add the carrots and the beef and stir constantly until the meat is almost cooked through, about 45 seconds. Then add the cooked Chinese broccoli and the sauce. Mix everything together and allow the sauce to reach a boil. The sauce will thicken. Stir until you achieve the desired consistency and pour everything over the noodles. Serve immediately.